Mitzi and Dustie, please tell our audience about yourselves and your experience? Mitzi, a leader in health care for over 19 years and has diverse experience in strategic development, service line planning within large health care systems. At LifePoint Health, she is responsible for providing overall direction, development and evaluation of the national physician relations team for 70 hospitals in 22 states, with the goal of establishing and achieving targeted sales objectives for service lines, markets and individual facilities. Mitzi is also responsible for overseeing the Strategy and Planning as well as the decision support teams for the organization. She is a national speaker to health care systems in physician relations program start up and development and specializes in positioning health care services and hospitals through referral development, network expansion and acquisition in highly competitive markets. She is noted for her ability to work effectively with hospital management teams and group leaders to develop annual organizational and individual hospital strategic plans that achieve outstanding business growth and physician loyalty. Before joining LifePoint 2 years ago, Mitzi has held the position as VP of Sales with Gentiva Home Health and Hospice leading the Southeast Division, Worked 8 years with HCA as VP of Sales, starting their physician liaison program for the TriStar Division and has a respiratory and infusion background with her experience of leading sales teams with American HomePatient and PharmaThera. She is a certified Professional Selling Skills Trainer and has conducted national sales trainings for many organizations around the country. A native of Philadelphia PA, she earned a bachelor of science in Nursing from the University of South Carolina and specialized in Pediatric Oncology. Dustie is a seasoned sales professional with more than 14 years’ of heath care sales experience that spans launching of pharmaceuticals, hospital service lines, home health business development and overall strategic planning to expand growth opportunities and the organizational return on investment. As a leader for LifePoint Health, she also provides direction, development, and evaluation for the national physician relations team for 70 hospitals in 22 states. Before Mrs. Maguire took the role of Regional Director of Physician Relations & Industry in 2015, she served as a Physician Relations & Industry representative for a LifePoint Hospital in Kentucky for 8 years. She was recognized for her ability to work successfully with her physician leaders and hospital administrators drive volume and increase provider satisfaction. Prior to LifePoint, Dustie, worked 3 years with the LHC Group, as a Patient Care Representative, responsible for generating strategic growth in the market. Finally, her professional sales experience started with Aventis Pharmaceuticals as a leader for the Metabolism Business Unit for all of Eastern Kentucky stretching into Tennessee and West Virginia. Dustie holds a Bachelor of Science in Biology from the University of Kentucky. Lee Ann: I’m the Senior Vice President for Healthcare Strategy at Stratasan. I’ve got over 25 years healthcare planning experience in large health systems, community hospitals and small critical access hospitals. I graduated from The University of the South in Sewanee, TN and Trinity University in San Antonio, TX. Physician Relations and Industry (PRI). Locally the employees may be called PRI or Physician Relations. PRI is internal language to LifePoint Health. Physician Relations has internal customers – CEO and leadership team and department directors. Physician Relations also has external customers – any referral source. That’s where the “I” comes in with LifePoint, industry, local employers. They work with employers to keep employees healthy and direct to occupational health. Where does the physician relations role fit organizationally? What is corporate’s role vs. local role? Physician Relation is part of Operations, Strategy and Integration Team under the leadership of the SVP of Operations, Strategy and Integration. Physician Relations at the Health Support Center are responsible for support, coaching and training of Physician Relations staff in the local hospitals. The Support Center serves as a consultant for the local Physician Relations at the hospitals. The local physician relations staff grows volume at the hospitals by calling on physicians. A goal for Physician Relations is to understand the importance of their role growing volume, improving quality, customer service, and access for the hospital. The Physician Relations representatives at the hospitals have a solid line to the CEO and a dotted line to Physician Relation at the Support Center. The focus of all departments at the Health Support Center is support and a resource for the local hospitals. Do you think that physician relations staff should report to the CEO of the hospital or elsewhere in the organization? It really depends on the size of the organization. In smaller hospitals, reporting to the CEO can be beneficial as the Physician Relations rep is the eyes and ears of the CEO in the physician environment. However in a larger organization, it is beneficial to report to a VP of Business Development, for example, because he/she will have more time to devote to the physician relations function. What are the goals of a Physician Relations program? To promote physician engagement in order to grow volume in alignment with the strategic plan. The purpose is to engage and connect physicians to other physicians and to support key hospital services. Physician Relations resolve issues and remove barriers to growth. Physician Relations unearth any quality, customer service or access issues the physicians may be experiencing by calling on the physicians. They ask questions and provide feedback to physicians and hospital staff. The Physician Relations reps in the field are the eyes and ears of the CEO out in the physician community helping him/her to determine opportunities for growth and improvement. What are the major responsibilities of the department? What is the difference organizationally between physician recruiters and Physician Relations? There should be a close relationship and in smaller hospitals it’s the same person. There is a team that should work together – recruitment, sales, practice manager, marketing to onboard a new physician and plan sales activities. What type of person – background, experience, etc. – do you like to hire for physician liaisons? The ideal Physician Relations rep will have a college degree and two years of sales experience preferably in medical supplies or pharmaceuticals. They will be organized, self-directed, assertive, outgoing, and have a hunter mentality. Can you describe this “hunter mentality”? The ‘hunter mentality’ can be described as an innate quality or trait that an individual has in order to successfully thrive in a competitive environment. “They only eat what they kill”, therefore, they go out and make their own way via determination, resourcefulness and persistence. These representatives are usually very independent, generate excitement around products, and pull energy from the “hunt” of new opportunities. The scenario is one of a very talented Cardiothoracic surgeon not receiving enough patient referrals to sustain a vascular program at a regional facility. The ‘hunter’ PRI has decided to try a new approach and take a few risks that may produce successful gains. She knows that the outmigration of services is high and suspects it is due to the small quantity of cases completed thus far. The primary care providers have expressed they want to wait and see what his quality outcomes look like before trusting his services for their patients. The ‘hunter’ gets frustrated with the lack of growth and support so she arranges for the CT surgeon to meet with local podiatrists. They agree they see a large volume of vascular cases that need to be referred to a specialists and the PCPs send them elsewhere. They agree to also send directly to the CT surgeon. They also met with all the regional podiatrists to ensure patient intake process. Within 2 months the CT surgeon was booked out on vascular cases. What measurements should be used to measure the success for the physician relations reps? Ideally measures would be volume-based measures as more mature programs have volume-based measures. 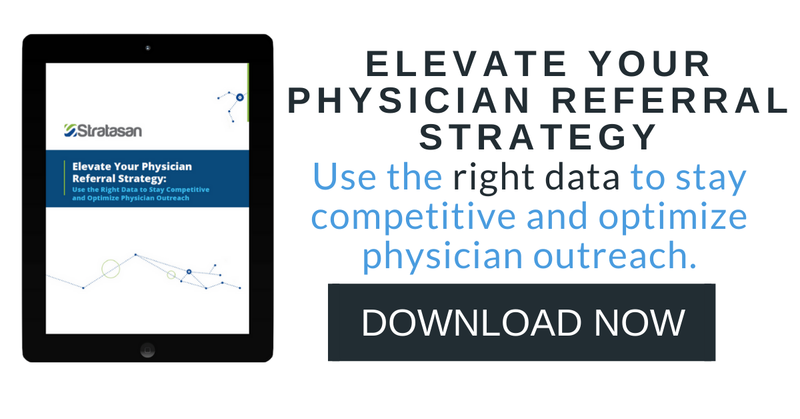 We are currently structuring the Physician Relations program around a data-driven approach to improve ROI. However, there also needs to be more than just volume measures, such as quality and satisfaction measures, but you have to be careful that the Physician Relations feel they have some control over these measures or they may be demotivating. I was reading the 2014 SHSMD physician relations programs in hospitals survey. 46% of respondents indicated that 10% or less of the employee’s base pay was incentive pay. 33% responded that 11-20% of base pay was incentive compensation. 63% of the incentive pay was based on financial targets/revenue growth. What would the ideal compensation package look like for physician representatives? It depends, most of what you see in the market is a combination of base salary plus annual bonus pay related to key service line growth to budget set forth by the organization. Have budgets and staff increased or decreased in the last few years? Staff have increased, salaries have remained competitive, but the departmental budgets are the same or less as hospitals cut budgets. Should hospitals coordinate physician relations visits around marketing pushes? Cardiology marketing for example. Yes, definitely. The local markets have “sales blitzes” around marketing a new service line along with the appropriate collateral material. We love to coordinate physician to physician encounters, primary care to cardiologists during a cardiology campaign. They are so much more powerful than Physician Relations only encounters. Each hospital has a strategic plan and from that, the marketing and sales plan is developed and coordinated throughout the hospital and system. The Physician Relations at the support center makes suggestions and shares best practices with the local hospitals during their sales planning for the year. Give me some examples of topics the physician relations representatives should cover with physicians? What types of physicians do the liaisons focus on? It depends, Physician Relations reps don’t call on physicians solely to grow volume, but also to improve quality and service to patients and physicians. The goal is to identify issues – access and barriers to using the facilities and specialists. It is easier to grow business where you already have some business so more time is spent with physicians who already use our hospitals and physicians than non-referring physicians. We track volume monthly so we notice any change in volumes and can call on physicians with changes either to thank them for more volume or to determine if there are any issues that need to be resolved to reverse decreases in volumes. Should physician relations representatives make appointments with physicians or primarily cold call? Depends on the relationship. We encourage new physician relations staff to make appointments, then determine a regular time to stop in. It’s important to have total office calls, where you are meeting with the front office staff, the nurses, as well as the physician. You can learn as much about barriers to referring from this staff as well as the physicians. What information do you use to determine on which service lines to focus? We use our strategic planning packages prepared by our Strategic Resources Group. They analyze the demographics of our service area, service area volume by product line, and our hospital market share by product line. These types of analyses help determine where there are market share opportunities in the service area. Talking with physicians can help drill to the next level of how to remove barriers and increase volume in those areas. What types of information do you use in your Physician Relations program? Physician Relationship Management - We use MarketWare – we track issues, issue resolution timeliness, enter physician profiles, and track calls and activity. Internal volume data – Internally, we use our cost accounting data from Axiom to track volume. We track in and outpatient procedures. The data from the previous month is available in approximately three weeks. We have growth meetings to discuss the data, whether volume has increased or decreased and any obstacles impacting volumes in previous weeks. Physician referral tracking – We use Stratasan’s Physician Patterns. Physician referral data helps the Physician Relations rep have the conversation with the physician, but is not presented to physicians. All the Physician Relations have control over is their time. The data helps them budget their time, who to take the cardiologist around to, who to educate on the referral process. The goal of using the referral data is to focus the time, determine routes, and organize and target physician visits. Could you tell me how Physician Relations could use Physician Patterns and what the benefits would be? Physician Patterns is easy to use to determine if a practice is performing or delivering results and driving volume in the way we had planned. The highlighting in the application enables a Physician Relations rep to see how cooperative and in sync a physician network is and how well physicians collaborate together. The tool shows if the physicians are working as a team for patient care and if the physicians are using available, community resources. Changes in network referrals can highlight quality or service issues between physicians if they’re referring outside the network, or not referring to one particular specialist. The app shows if there is an obstacle preventing utilization of a specialist. Some physicians won’t tell you about another physician, but the data will. The tool gives Physician Relations direction. A sales team without data is blind. The app identifies which providers to take along on visits to market services. It helps with questions to ask – quality service issues, barriers and you know who to thank for their business. Physician Patterns focuses Physician Relations on routing. Time is valuable and the tool shows Physician Relations reps where to focus and identifies physicians for follow-up visits. It identifies low hanging fruit from splitters or shows physicians who don’t refer so we don’t waste time calling on them. It is easier to build referrals where you already get referrals because it takes a long time to build where you don’t have business. It is a tool for CEOs and physician services to assist with recruitment plans. The CEO can show prospective physicians the volume that stays in the area, for example referrals to neurosurgeons from other physicians. We’ve talked about the many ways to use data in physician relations programs. In 2015, there were at least three lawsuits settled by the federal government against hospitals that were compensating physicians based on referrals violating Stark law and the federal false claims act. How should hospitals NOT use physician referral information? It is also important that anyone who receives physician referral information not use for any of the above purposes. Hospitals and systems have to train all employees who have access to physician referral information on the applicable regulations. Speaking of training, what type of training should hospitals provide for physician relations staff? There should always be service line training, compliance training with the current trends that are happening in the market. If you would like more information or would like to see a demonstration of Stratasan's Physician Patterns, please contact Sean Conway at Stratasan. Stratasan provides intelligence to hospitals, healthcare systems, marketers and physician relations representatives equipping them to make better decisions and maximize system growth. We partner with over 900 hospitals helping them achieve efficiency and effectiveness in their strategic planning initiatives. We provide an analytics platform, project services, and physician patterns. LifePoint Health was founded in 1999. With more than $5.0 billion in revenues, it is financially strong with the best balance sheet in the industry. Including more than 70 hospital campuses in 22 states, approximately 40,000 employees, and more than 6,500 physician relationships, LifePoint Health is a leading healthcare provider in communities across the country. Under the mission of "Making communities healthier," it is fully accredited by The Joint Commission and committed to keeping healthcare local. Interview conducted by Lee Ann Lambdin, VP of Strategic Resources for Stratasan. Lee Ann Lambdin is Senior Vice President of Strategic Resources at Stratasan. Lee Ann is responsible for leading the production team, a team of health analysts and GIS specialists who assist customers with marketing and planning intelligence. In addition, Lee Ann is responsible for Stratasan’s expert thinking initiative. Prior to Stratasan Lee Ann held planning leadership roles over the past 20 years in healthcare with systems such as Saint Thomas Health, Brim Healthcare, and Covenant Health.